Introduction: I'm a Chicago-based guitarist influenced by Spanish classical and contemporary finger-style guitar. My unique style of playing uses a lot of close intervals, open strings, and short repeating phrases, which gives my music a gentle, meditative quality. As such, it is perfect for intimate settings like wine bars, restaurants, art fairs, gallery openings, private parties, weddings, corporate gatherings, and other special events. Mission: All of the music I play is original, played on a lightly-amplified nylon-string guitar. What I enjoy most is filling a room, or hall, or outdoor space with quiet, meditative sounds, often in response to the people and environment around me. I learned this years ago when I was playing in a small coffeehouse. As a group of people ended their meeting with a moment of silence, I followed their quietness, their breathing, with my guitar. When they opened their eyes, all of them spontaneously turned and looked at me as if something very special had just happened. It did: I learned to pay attention to the audience's needs, not just to my own. 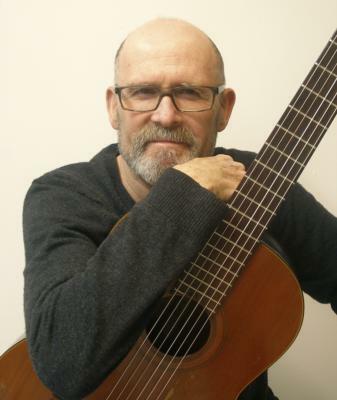 Influences: My classical guitar influences include: Francisco Tarrega, Fernando Sor, Joaquin Rodrigo, Leo Brouwer, Bola Sete, Alfredo Muro, Baden Powell, and Isaac Albeniz (a composer/pianist whose music has been transcribed for guitar). My progressive finger-style guitar influences include: Ralph Towner, John Fahey, Phil Keaggy, Peter Lang, Robbie Basho, and Leo Kottke. My non-guitar influences include: Zoe Keating, Jody Savall, Anouar Brahem, Jan Garbarek, Paul Bley, Erik Satie, Phillip Glass, and Sam Newsome, to name a few. Member Status: Don't let the "new member" status fool you, I've been playing guitar since I was a teenager. In fact, I've been playing the same guitar--a Guild Mark IV classical guitar--for the past forty years. My Other Career: If you look me up on the web, you'll also find out that I have another career, as a professional writer. I've been writing books for readers young and old for the past thirty years, all of which have a lyrical quality. Yes, I employ my interest in music in both my guitar playing and my writing. To me, they are one and the same. Please note W. Nikola-Lisa will also travel to Cicero, Berwyn, Oak Park, Forest Park, Hines, Lyons, Riverside, Brookfield, Maywood, River Forest, Summit Argo, Carol Stream, La Grange Park, Bellwood, Bedford Park, Melrose Park, Westchester, Burbank, Bridgeview, Hillside, Hinsdale, Hometown, La Grange, River Grove, Stone Park, Western Springs, Berkeley, Franklin Park, Justice, Norridge.